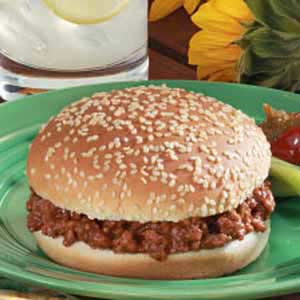 Sloppy Joes are one of my favorite comfort foods, taking me back to my childhood. There are many variations to make it, and various ingredients you can add, but I like it more on the simple side. I found this easy recipe on Taste of Home, and the recipe yields 4 servings. In a large saucepan, cook beef over medium heat until no longer pink; drain. Stir in the ketchup, water, brown sugar, Worcestershire sauce, mustard, garlic powder, onion powder and salt. Bring to a boil. Reduce heat; cover and simmer for 30-40 minutes. Serve on buns. YUM -- easy and nostalgic... Perfect! Yum! I need some comfort food right now and these are perfect. What a great cafeteria throwback! Looks tasty! Dunno why, but this looks sooooo good! Am craving now! In the UK we have Pizza Express who do an amazing Sloppy Joe's pizza... with the right amount of kick! I loooove sloppy joes. I need to try this recipe. This reminds me of my middle school days. Waiting for delicious sloppy joes!